The BOOT.INI as a part of the MBR is created by Windows Setup and not influenced by any nLite processing. Is it possible, that you installed XP onto a not empty partition? If yes, you should redo the XP installation, but format the destination partion before starting the real installation. a ) Boot off the XP CD, use the "Repair" function and create a new MBR or boot sector by running FIXBOOT and FIXMBR (for details do a google search for "FIXBOOT" or FIXMBR"). Thanks for your help, I too didn't think it would be related to nLite, but I'm puzzled. I only have one hard drive turned on, it only has one partition. Every time I've tried it, I did a format. I've tried both Quick and Regular format. It installs fine, but then during the reboot, it goes into a reboot cycle because the boot.ini is wrong. Like I said, I now I can edit the boot.ini and make it correct, but I am trying to test this CD and make sure everything works properly so the next time I install XP, I don't have to go through these hoops. If you are as stumped as I am at this point, I can make my own thread to keep this one on track as I don't want to mess this excellent thread up. How did you realise, that the wrong boot.ini is the reason for the reboot cycle? If this doesn't work either, hit F8 while booting and enable the "No reboot at system failure" option. Then you can read the error message. well, I turned on my other hard drive (which has Vista installed) and booted into it with both HD's on. it will work. I just don't understand where the other one - signature(ca2d9e57) is coming from when I install. It has nothing to do with nLite and your nLited CD. Thanks Fernando, you've been a great help. I suppose, that your issue has somethiing to do with your handling of the 2 hdd's. b ) that you choose the correct HARD DISK BOOT PRIORITY settings within your BIOS. Great article! But I still cannot get Windows Setup to recognize my SATA drive. I used all the drivers you mentioned. My controller is the Intel 82801FR SATA AHCI. I did not see that one listed the driver list that comes up when I loaded your infs. Many others do, but not the FR version. Do I have the wrong ones? As a result Windows Setup only sees my SATA boot drive if I change the BIOS the COMBINATION mode instead of RAID autodetect/ AHCI. When you say that doing this loses all AHCI funtionality, I can still load the full Windows driver once I get there and restore full functionality so I can change the BIOS back to AHCI, right? Yes, the "old" Intel 82801FR SATA AHCI Controller is not supported anymore by Intel's actual textmode drivers (Intel Matrix Storage Manager). As a consequence it is possible, that your mainboard doesn't have the full AHCI features. If you want to get AHCI support for your Intel S-ATA Controller, you should take the Intel Raid/AHCI drivers from your Dell CD or download this driver package (it is not easy to extract it without a floppy drive). If you don't have RAID, you shouldn't set the BIOS to "Raid". The "autodetect/AHCI" BIOS option should detect your Intel SATA AHCI Controller. Try to load the Dell Intel drivers (from the Dell CD or from the download link I gave you) and look what happens. If it doesn't work this way, you should integrate the drivers into a bootable XP XD and do a fresh install. Was wondering if you can tell me what's going on here. So i installed with the Jmicron drivers, plugged into the GSATA ports etc. 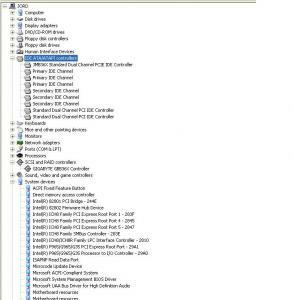 But now under IDE/ATA Controllers i have all of these entries 3 - 'Primary IDE Channel' 3 - 'Secondary IDE Channel' and 2 - 'Standard Duel Channel PCI IDE Controller'. 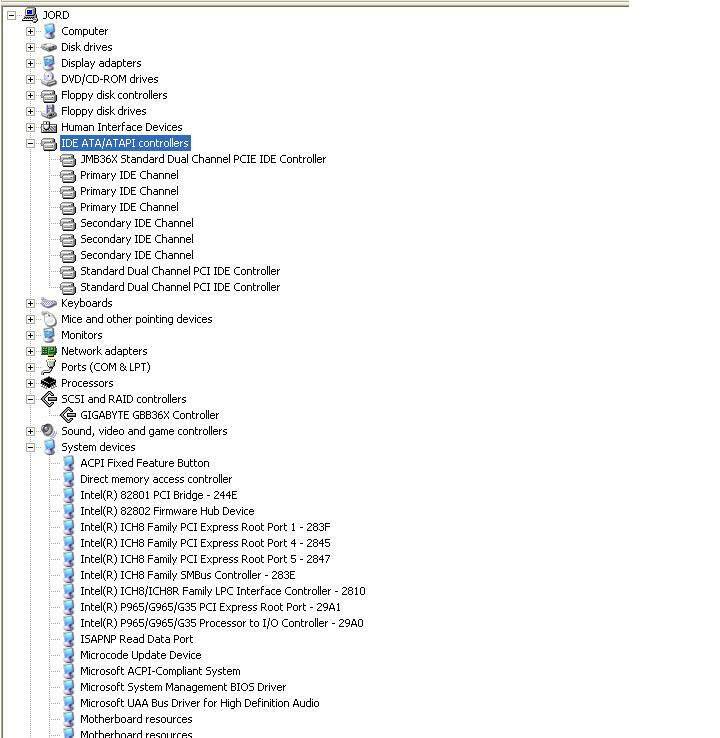 Also, upon each restart, i always have an 'Other Devices - PCI Device/Unknown Device' entry in my device manager which i can't seem to stop. The MS and the JM36X Standard Dual Channel PCI IDE Controllers are managing your enabled native IDE ports (unused or for example connected with your optical drives), whereas the GIGABYTE GBB36X Controller manages the S-ATA hdd connected JMicron SATA AHCI Controller. Have an additional look into the "disk drives" section of the device manager (name and properties of the hdd). Your system is missing a driver (HDAudio?). Do a right click onto the unknown PCI device and check the details (Hardware ID). Thanks for quick reply. I think i've discovered what the 'Unknown Device' is now. It says location: 'X1900XT Radeon (Omega) series' which would be my Omega drivers. These are not officially digitally signed by ATi, so device manager probably won't recognize them. Is there a way i can stop it from trying to? Because i know they work fine. As for the disk-drive, here is the entry inside Disk Drivers:- SATA WDC WD50 SCSI Disk Device. Some ATI cards need the drivers 2 times. 1. Right click onto the unknown PCI device. 2. Hit the "update driver software" option. 3. Point to the Omega driver again. After the driver install the yellow mark and the "Unknows PCI Device" hopefully will be eliminated and you will get 2 graphics adapter entries. Thanks buddy, ill let you know how i get on later today. 3:36AM here, just got in from work.